Not nearly as entertaining as it should have been, this movie has it’s heart in the right place, and includes multiple monsters, but it somehow manages to still not be enough. This is a movie that definitely has a plan, and does a lot of things right, but still isn’t all that interesting or exciting. especially not in the creature on creature action scenes, where it should be at it’s best. instead, this movie takes it’s time building up the human story and is able to accomplish a good deal that way. especially with bryan cranston. as long as he’s on the screen, this movie is pretty entertaining. but once he leaves, we are forced to rely on aaron taylor johnson for the human element, and he just can’t pull it off. regarding godzilla himself, he is pretty cool at first, but after a while, even he gets tiresome. that’s when they bring out the fire breath. it’s a nice touch, but not enough to get our attention back. i like how the movie used multiple monsters, but the mutos (as they are called), did not look cool enough, and certainly couldn’t compete with the creatures from pacific rim, from just a year before. 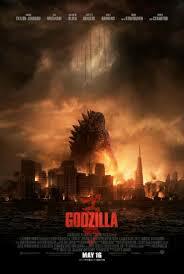 godzilla, the new hollywood reboot, is an interesting take on an old property. this creature has gone through the ringer with how many times his story has been told. there was the original series, which spawned tons of sequels. then there was the hollywood version in the nineties, starring matthew broderick and jean reno. that movie was pretty lousy. and now, we get a version that tries for a little bit of both. it’s certainly the hollywood, big budget take, featuring lots of american actors. but it’s also got the japanese culture worked in there, starting out in japan, featuring ken wantanabe as one of the leads, and definitely showing where it’s influence comes from. the movie has a fantastic opening. there’s bryan cranston as joe brody, a scientist at a nuclear plant in tokyo. his wife works there too, and brody and her are at the plant at the same time, doing some very different things. she is investigating something in a tunnel while he is over in the control room. when there is an accident involving radioactive material that gets loose, like an attacking cloud of black smoke, brody is told to lock the door and prevent the smoke from getting into the lab. there’s just one problem. his wife is still inside the tunnel. watching her and her team run from the smoke, and watching brody debate about whether or not to lock the door, is pretty exciting. sure, the scene is similar to one at the start of the movie the rock, with david morse having to lock guys in, but here there is so much more weight involved. this is the man’s wife and he is the one pulling the trigger. unfortunately, that opening ends up being the best scene in the entire movie. 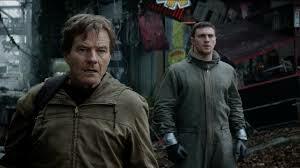 it’s a scene that rests on human capability as opposed to monsters and giant creatures of the sea. but this director, gareth edwards, is pretty smart. he knows, (by taking a page from spielberg’s jaws). that the longer you wait to show the monster, the more story and characters you can build up. he also knows that the longer you resist showing him, the more excited the audience will be. we rejoin the characters fifteen years after that radioactive attack in japan. now there are scientists who are flying to the phillipines, where giant craters have formed in the ground and there are massive levels of radioactivity burried below it. we meet up with joes son, ford, in san francisco, as he returns home from the armed forces and his tour overseas. ford isn’t home very long when he gets a phonecall that his father has been arrested in japan. just like that, he hops a flight and goes to see what he can do to help. back in japan, ford is able to get joe out, and then somehow joe shows his son the data and convinces him that they need to go back to their old house, where they lived before that radioactive accident that killed ford’s mother. there should have been more convincing and explaining here, considering that this is how joe got arrested in the first place, but the two of them go back to the house, nonetheless, and soon they are being picked up a team of scientists, and brought to a top secret headquarters. this is where the first monster attack happens. it is not godzilla, but instead, a creature that they refer to as a muto – massive unidentified terrestrial organism. the muto has some pretty cool legs and looks a lot like the creature from cloverfield, in body structure. but it’s head looks ridiculously fake and it has a slanted red eye that makes it look more like a machine than a creature. the muto breaks out of where it is being held and attacks. this sends ford back to his family in america. there’s just one problem. he has to go through hawaii first, in order to get there, and a lot of craziness is about to go down in hawaii. before he can even hop a flight away from the science base, however, scientists wantanabe and sally hawkins (so good in blue jasmine), sit him down for a talk. they want to know what ford’s father knew. he tells them how his father picked up some sort of call, or ecolocation. the scientists are able to take this and run with it, knowing that it means there is more than one muto and that they were communicating with each other. it isn’t until ford is in hawaii, on an air tram heading toward a different terminal at the airport, that we finally see godzilla. it actually hasn’t felt like that long (despite it actually being about halfway through the movie), and that is in large part due to the human story being so interesting. now that godzilla appears, however, things are about to change. first, there is a muto attack on the train that ford happens to be on, and he ends up dangling from a broken train car and grabbing a little kid who is falling next to him. then godzilla shows up in all of his glory. i really like the way even when it’s time for godzilla to make his appearance, the movie takes its time showing him to us. first it’s the giant plates on his back sticking out of the water like massive shark fins. then it’s a scene in the dark of night where soldier fire flares into the sky and it is only by the light of these flares that we are able to see the scales and creature that is temporarily lit up when the flares get close to it in the sky. but then all of the fighting starts to happen between godzilla and the mutos and it’s not half as interesting or exciting as it should have been. while i do applaud the movie for having multiple monsters, this just can’t compete with the last multiple monster summer movie we saw, pacific rim. in that film, the creatures got lit up by bright yellow and green neon blood that came oozing out and splashing everywhere like it was glow in the dark, and meant to keep everything lit up. in godzilla, most of the scenes are also at night or on foggy and smokey days, only there is nothing to light the creatures up. the story that led up to all of this was just okay, with bryan cranston (the best actor on board here,) exiting the movie way too quickly. and the explanations about the mutos, their hunger for radioactive energy, and godzilla, leaves somethign to be desired. the movie had some cool strategies, especially in the first half, but it wasn’t all that exciting once the monsters finally arrived.